This is their last week here, as they will all be going home next Sunday! I’m continuing to work on the basics with them. They have playtime outside so they can exercise their little growing bodies in the fresh air and sunshine. Although today they had their first taste of rain as it sprinkled a bit when they were out there. 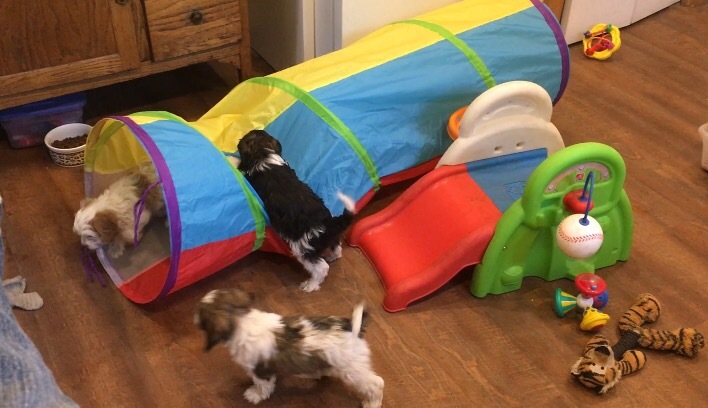 And they have playtime inside, with their toys and puppy obstacles to conquer. They are learning to sleep in a crate together in their puppy pen. 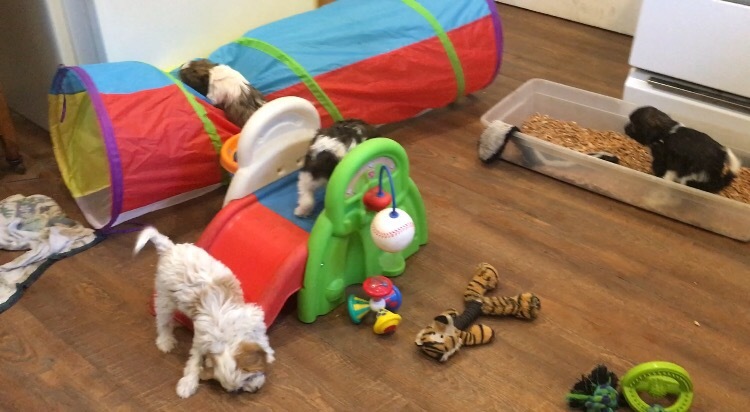 And actually since there are extra puppy pens in the puppy room, I’ve split them up in different groups (two in one and three in the other) in two pens so they start getting use to being separated at night. When they’re in the house or playpen they have their litter boxes available. It amazing too see how they use them. There are usually two litter boxes for each play pen. When I clean them, lots of times one seems to be used for poop and the other to pee in. And when they play outside in their play area, they mostly go to the back corner or fence line to potty. Such smart puppies! We’ve had some clicker sessions; first getting them use to what the clicker sound means and then “marking” behaviors. The first behavior we have worked on is called “manding”. This is where the puppy learns to sit (but we don’t teach “sit”) when he/she wants attention from a human; as opposed to jumping up for attention. This will probably need to be continued training at home until he/she “gets” it completely. The puppies had their first individual meals in a crate too. They learn that good things happen when we go in a crate. (You never want to use a crate for punishment). And while they were eating their yummy meal in the crate, I worked on resource guarding prevention training. What’s that, you may ask? Resource guarding is where a dog think “this crate is MINE”, this toy is MINE”, the food is “MINE”, the person’s lap is MINE”. You get the picture. A dog can become possessive of things and people. And some can get snappy and aggressive about it. So how do we prevent that? By these simple exercises we do within the first twelve weeks of a puppy’s life. The first thing we do is give puppy a bowl of food, then while puppy has his nose in the bowl we reach in the bowl with a tidbit of something even better and add it to his dish. Some puppies may even stiffen, growl or get a “hardened” look in their eye. We do not reprimand puppy if that happens, but just keep going. After a maybe one or two sessions you’ll see a whole different demeanor in the dog when our hand approaches the dish. 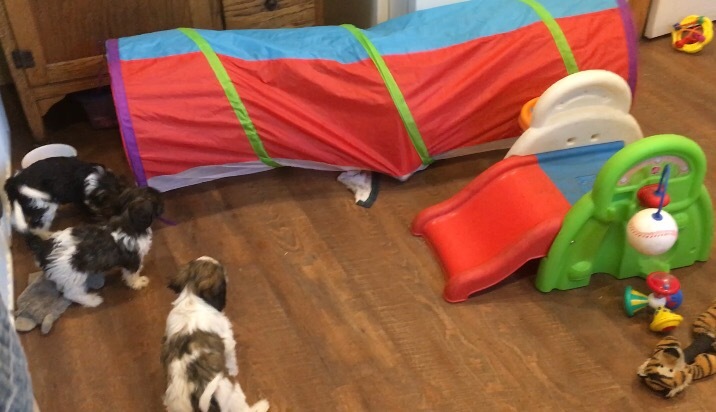 (I don’t think I’ve ever seen a Cavapoo react this way). Next we would reach down and pick up the bowl while puppy is eating (hide the treat behind your back), and then hand puppy the “better treat”, then return the bowl. You get the picture? We’re giving him something better than what he had. Puppies can also tend to guard laps, crate, couches etc. so continue practicing with in these scenarios also. You might sit on the couch with puppy in your lap and have someone walk up to you and give the puppy a treat. Or have someone hold puppy and you walk up and give puppy a treat while they are standing there holding the puppy. Puppy will learn whether he is eating, sleeping in his crate, sitting on you lap or whatever the case may be, that when someone approaches, it’s a GOOD thing! 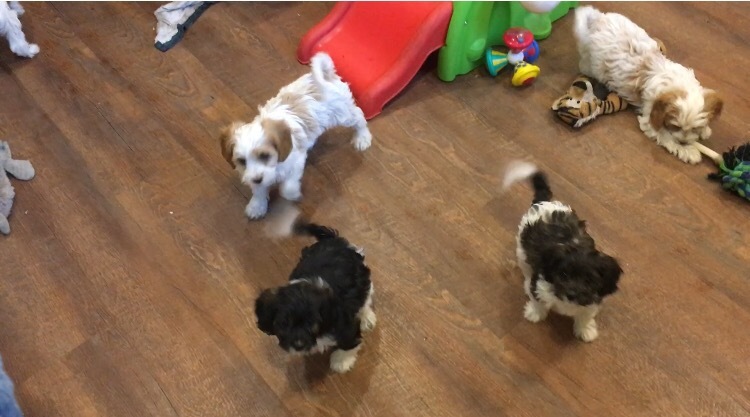 The puppies will be getting their last type of de-wormer this week and their puppy shot before they head in to the vet for their exams (and micro-chips and health certificate if needed). I’m sure the week will fly by! 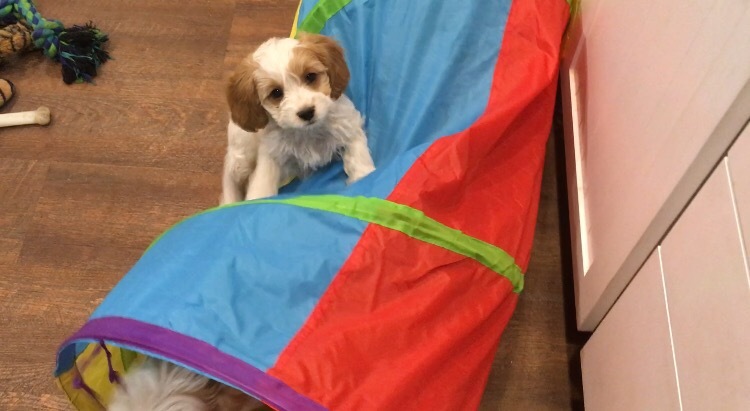 This entry was posted in Cavapoos, eight weeks, Puppies and tagged aggressive, approaches, attention, basics, behavior, better, bowl, cavapoo puppies, cavapoos, clicker, continued, couch, crate, de-wormer, demeanor, dish, eating, eight weeks old, exam, exercises, eye, final, food, fresh air, good, growl, guard, hand, health certificate, holding, home stretch, individual, inside, lap, laps, last, learn, learns, life, litter box, litter boxes, lives, manding, marking, meals, micro-chips, nose, outside, pee, people, picture, play area, play pen, playtime, poop, possessive, potty, prevention, puppies, puppy, puppy obstacles, puppy's, race, race car drivers, rain, reach, react, reprimand, resource guarding, scenarios, separated, sessions, shot, sit, sleeping, snappy, sprinkled, standing, stiffen, sunshine, thing, tidbit, toys, training, treat, twelve weeks, vaccination, vet, walk, week. Bookmark the permalink.